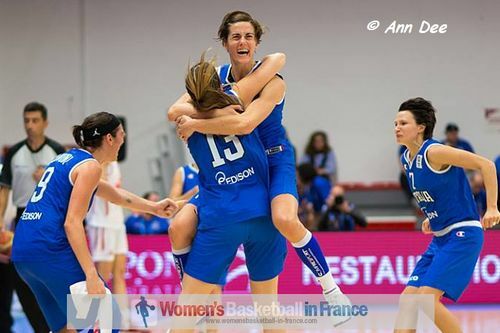 The last day of EuroBasket Women Group E action turned into a powerful display and passion with Italy and Sweden claiming their places in the quarter-final matches. Spain beat Turkey (61-48) to claim first place in the group. Italian international Raffaella Masciadri turned the clock back during the second half of the match with her clutch shooting to help her team turn an 11-point first-half deficit into a (66-60) victory. Masciadri finished with 15 points while Giorgia Sottana, Ilaria Zanoni and Francesca Dotto chipped in 13, 12 and 11 points respectively. Kathrin Ress was busy taking rebounds, finishing with 12, practically half of her team's total of 25. In a pulsating first half Montenegro were on fire and and led (45-34) at the break. However during the second half everything went wrong. The limitation of their roster was exposed as they did not have anybody to cover for Iva Perovanovic who despite playing was not at 100%. Jelena Dubljevic did everything in her power with 20 points and 14 rebounds for Montenegro. But with her team managing just 15 points during the whole of the second half, their chance of qualifying for the final stages of EuroBasket Women disappeared. Italy's victory meant that Montenegro could only qualify if Sweden lost to Slovak Republic by a minimum of 9 points and a maximum of 17 points. It is almost impossible to write an article about Sweden's women's teams without the mention of "Eldebrink ". Frida finished with 17 points, 4 assists and 3 steals while her twin sister Elin had 11 points and 3 assists. 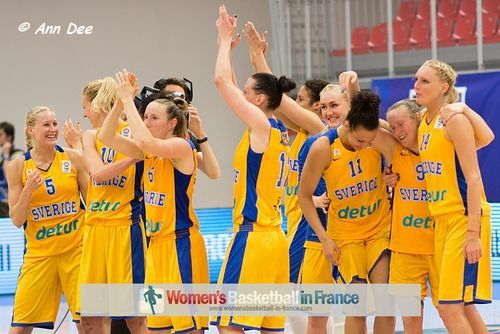 However Sweden needed their full roster to hold off the Slovak Republic in an exciting finish (75-72) to take the last quarter-final place. The first 20 minutes were played at an electrifying pace with Sweden trying to run their opponents out of the arena (46-36). Yet the Slovak Republic needing an 18-point victory to qualify did not panic and fought tooth and nail all during the second half as they attempted to force overtime. The last minute of the game was littered with time-outs and free throws. Ashley Key (10 points) from Sweden hit the final free throws to give Sweden a 3-point lead. The Slovak Republic were unable to get a three-point shot off or an and-1 play in the remaining seconds and the game was over. For Sweden Elisabeth Egnell was joint top scorer with 17 points alongside Frida Eldebrink while Lucia Kupcikova from the Slovak Republic ended her tournament with 15 points. Spain beat Turkey (61-48) in the most technical game of the day in which scoring was made difficult by good defensive systems. Both teams hit just over 35% of their shots. Spain's ability to get to the free-throw line (13-of-15) was a big factor in their victory. Silvia Dominguez (11 points and 3 assists) and Sancho Lyttle (18 points and 13 rebounds) got Spain off to a good start with 7 and 4 points respectively during the first quarter (15-10). But it was the 15-0 run during the second quarter that put Spain in the driving seat by the break (32-17). Turkey picked up during the third quarter and outscored Spain by 10 points (38-43). Spain put an end to the Turkish comeback with a 10-0 run to open the final quarter and end the match as a contest. The major highlight from the final quarter was a three-pointer by Elisa Aguilar from Spain shortly after coming on in the closing minutes.